Maine Veterinary Medical Center in Scarborough sees about five dogs a week that have ingested marijuana since the drug was legalized in Maine. SCARBOROUGH (NEWS CENTER Maine) -- Recreational marijuana is now legal in Maine, but that doesn't mean it's safe for your pets. Veterinarians all over the state are seeing more cases of animals, dogs in particular, ingesting their owner's marijuana. 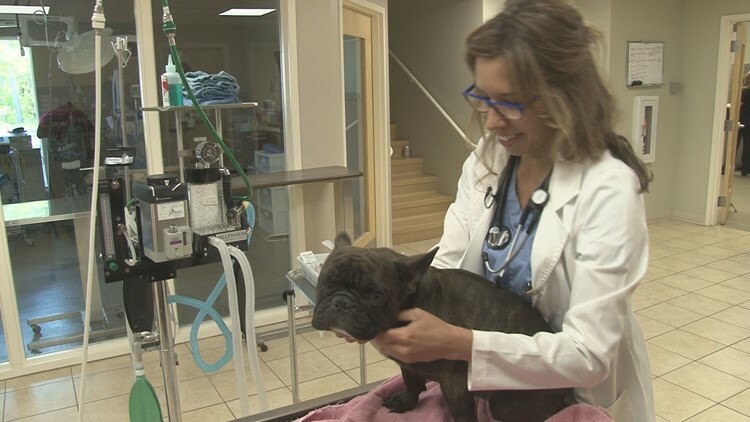 At Maine Veterinary Medical Center in Scarborough, there are as many as five patients a week that are admitted after eating the drug, according to Dr. Kate Domenico. "They have a low heart rate and they still wag their tale and act like they are relatively normal mentally," said Dr. Domenico. "Some dogs will even come in somewhat comatose, so that would be the most extreme." Jack the French Bull Dog. Diarrhea and vomiting are other signs that a dog will show after eating marijuana. Most come out of the high after 24 hours, but some of the worst reactions seen at Maine Veterinary Medical Center have taken up to three days to recover. Dr. Domenico says that an antidote called Intralipid is used to help pets come out of their high faster. There is a form of marijuana that is safe for pets. "Cannabis oil which takes out the sedative effect is being used in some cases for like seizures, pain control," said Dr. Domenico. It's the marijuana meant for people that has the opposite, more dangerous effects with their four legged friends and should be kept safely out of reach of dogs and other pets.